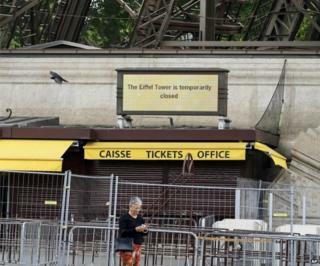 Image caption The company that runs the tower said it "regrets that visitors... are being punished". The Eiffel Tower shut down for six hours because of a staff walkout in protest against a surge in pickpocketing gangs. Workers say the gangs are increasingly threatening them with assault or abuse. The company managing the major tourist attraction "thanked the public for its understanding" and said it "regrets that visitors... are being punished". About seven million people go up the tower every year. The tower reopened on Friday afternoon. Staff are demanding "formal guarantees" from management to stop pickpocketing gangs who target numerous tourists every day. The staff's union representative, Denis Vavassori, told the AP news agency that the staff had walked out "so we could ask for a permanent police presence here". The thieves "form a gang of four to five people", and sometimes there can be about 30 of them surrounding the tower, one of the striking workers told the AFP news agency. Occasionally they even "fight among themselves". Another striker said that he had been threatened while chasing away a pickpocket: "He said to me, 'why don't you let us work... if this continues you will have problems'." A similar closure took place in April 2013 when the Louvre art gallery disappointed hundreds of tourists by closing down after staff complained of being spat at, abused and even assaulted by pickpocketing gangs. More police were sent to protect the museum, which is visited by 10 million tourists every year. Paris hosted 22 million visitors in 2014 according to city figures, and is one of the world's top tourist hotspots in addition to being a magnet for criminals and pickpockets who especially target wealthy Asian tourists. The daily Liberation newspaper reported on Friday that about 26,000 police and municipal agents would be deployed in the city throughout the summer to deal with the pickpocketing threat.